KIEV, Ukraine -- Less than a year ago, Viktor Yanukovych was not yet the disgraced former president of Ukraine and ruled over his impoverished but peaceful nation from Mezhyhirya, his sprawling residence outside Kiev. 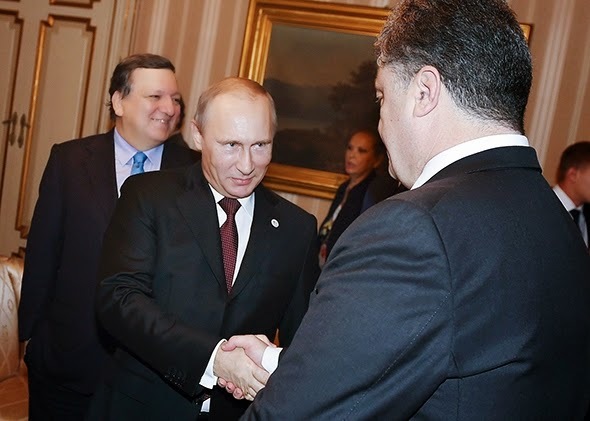 Russian President Vladimir Putin (C), shakes hands with Ukraine's President Petro Poroshenko in Milan on Oct. 17, 2014. Here Yanukovych entertained his cronies aboard a fake Spanish galleon, watched TV from the comfort of his wood-paneled Jacuzzi, and prayed for redemption in a jewel-encrusted private chapel. The main house—an outsized, five-story peasant cottage—is nicknamed Honka, after the Finnish company that built it. Today a wild-eyed revolutionary named Petro Oliynyk offers visitors an express tour from bowling alley to bedroom at $15 a head. Wrapped in the black-and-red flag of the World War II–era Ukrainian Insurgent Army, Oliynyk coasts across Honka’s inlaid wooden floors in traditional straw shoes. Mezhyhirya has become to Kiev what Versailles is to Paris—except Ukraine’s revolution is far from over. A 34-year-old native of western Ukraine, Oliynyk is mad as hell. He protested on Kiev’s Maidan for three months last winter until Yanukovych fled on Feb. 22 after a bloodbath that left more than 100 people dead. Oliynyk, who says he has been guarding Mezhyhirya since that day, blames fellow activists for looting the residence. Worse yet, he is convinced the new authorities granted Yanukovych safe passage to Russia and unleashed a war to cement their own grip on power. Oliynyk isn’t alone in his anger. Not even half a year into Petro Poroshenko’s presidency—and days before early parliamentary elections—Ukraine is still in upheaval. As if the Russian-backed insurgency in eastern Ukraine weren’t bad enough, the rest of the country is divided over how to overcome the legacy of two decades of rampant corruption. Former Maidan protesters grumble that Poroshenko, a political insider who built a candy empire, is hardly the kind of leader they risked their lives for. Cynics suspect the fighting in the east is only a cover for the latest round of robbing the treasury. Even the president’s well-wishers fault him for surrounding himself with weak, pliable ministers and rarely explaining key decisions to the people, not unlike Yanukovych. In an impatient country awash with fighters and weapons, the threat of a new revolt is very real. Poroshenko’s backers argue that only the vote on Sunday will give him the legislative mandate the country needs for sweeping change. To head off criticism in advance of the election, Poroshenko signed off on the formation of an anti-corruption bureau and a “lustration” law barring public servants affiliated with the old regime from office. The president’s party—the Petro Poroshenko Bloc—is expected to win about a third of the vote and spearhead a pro-reform coalition in Parliament. Poroshenko’s window of opportunity is limited as winter sets in and the economy continues to nosedive. Various Maidan activists, journalists, and soldiers are running as guardians of the revolution for the Poroshenko Bloc and Prime Minister Arseniy Yatsenyuk’s People’s Front. Yatsenyuk split with his mentor, Yulia Tymoshenko, who has been unable to reboot her political career since the fall of Yanukovych. Among the new faces expected in Parliament are Serhiy Leshchenko and Mustafa Nayyem, two muckraking reporters who exposed the rot inside Yanukovych’s kleptocracy. While they have been mocked for going into politics, the pair say they are following the call of civic duty. “After the Orange Revolution, the country was naive,” says Leshchenko, recalling the wave of euphoria after Kiev’s last demonstration of people power a decade ago. As for the commanders of volunteer battalions who are also running for office, Leshchenko says it’s better they take their fight to the corridors of power than to the streets. One of the first legislative changes Nayyem wants to see won’t be popular: raising the pay of parliamentary deputies. After salaries were slashed to less than $500 a month in a fit of post-revolutionary fury, they should at least be tripled to forestall the corrupt practices of the past, Nayyem says. In the old Parliament, slush funds were used to pay deputies $500 for staying at home, $1,000 for showing up but abstaining from a vote, and $2,000 or more for initiating an inquiry, he says. Some deputies even used their parliamentary immunity to smuggle expensive Swiss watches into the country and sell them at a profit. While the elections should help Poroshenko’s ability to push his pro-Western agenda, they will also solidify the division between the regions under Kiev’s control and those now under Moscow’s. The elections won’t take place in Crimea, which Russian President Vladimir Putin annexed in March, as well as large parts of rebel-held areas of the Donetsk and Luhansk regions. The separatists have called their own elections for Nov. 2 to lend a whiff of legitimacy to their shadowy, self-proclaimed leaders. The cease-fire hammered out between Poroshenko and Putin in early September exists in name only, as the rebels try to wrest strategic Ukrainian holdouts, such as the Donetsk Airport, before a more lasting peace takes hold. Civilians continue to get killed in the crossfire. Paradoxically, the more the cease-fire line is respected by the combatants and monitored by international observers, the greater the risk it will become the de facto border of a frozen conflict. Even if the so-called Donetsk and Luhansk republics haven’t been recognized by any foreign governments, each day their existence taunts and stymies the central government in Kiev. “The Kremlin doesn’t want more land but unresolved problems that can’t be fixed,” says a Western ambassador in Kiev. The “party of war”—which includes the Popular Front, Tymoshenko’s Fatherland party, and more radical groupings—sees a military solution to the conflict. Yet Poroshenko, despite his posturing as a tough commander in chief, had little choice but to agree to the cease-fire. Furthermore, it would have been problematic to carry out elections while active combat operations were taking place. With unrest brewing in his own capital, Poroshenko sought a welcome timeout. Yet nobody is satisfied with the status quo. Ukraine is counting on Western support more than ever, but not without a certain sense of betrayal. “We don’t have a Churchill, only a whole range of Chamberlains,” says Kostyantyn Hryshchenko, who served as foreign minister and as ambassador to the United States. What Ukraine really needs is an economic recovery program comparable to the Marshall Plan, he says. Kiev, once an easy-going city famed for its hospitality, has become a gloomy place after almost a year of nonstop strife, from protests and street battles to revolution and war. Many residents worry about staying warm this winter if a dispute with Russia over natural-gas prices isn’t resolved. Others wonder whether the fighting will reach the capital. One influential TV journalist privately says he expects Russia to launch airstrikes on the city to open a land corridor to the Crimean peninsula, which is cut off from sea routes during the winter. The unpredictability of events has made perfectly reasonable people sound hysterical.